According to Webster's New Twentieth Century Unabridged Dictionary, the word prestige "is a noun that means a delusion, an illusion, a juggler's trick, from praestinguere, to darken, to obscure." Christopher Nolan's latest feature film certainly possesses those characteristics, but it is much, much more. 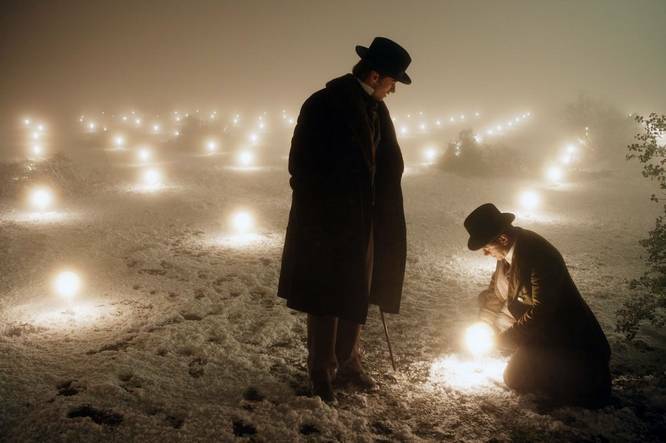 THE PRESTIGE is a brilliantly conceived, beautifully executed character study concerning two rival magicians obsessed with outdoing one another in shadowy, gas lit, Victorian England. Clearly this is the kind of movie hack director M. Night Shyamalanadingdong wants to make but proves repeatedly incapable of doing due to his egregious lack of talent. However, in the deft hands of Mr. Nolan we get a motion picture masterpiece so rich in texture that it succeeds in being part murder mystery, part drama, part suspense, part fantasy and part science fiction all at once. Abracadabra! Even Houdini couldn't have pulled this rabbit out of a hat. Just as you would expect from a world-class magician, THE PRESTIGE is clever, tricky, and deceitful, but be advised that many of the magical moments are not unveiled in a straightforward chronology. This complexity is extremely rare, especially given the plethora of insipid sequels, prequels and remakes that dominate the nation's theater screens today. It is also risky to make today's audiences have to pay attention and to actually think. However, it is precisely this combination of rarity and risk that makes THE PRESTIGE so rewarding and why it is the kind of movie that is best enjoyed by not knowing too much going in. Accordingly, I will refrain from giving any additional information other than to reiterate that THE PRESTIGE is one of the best movies of the year and that I fully expect it will garner serious, well-deserved Oscar consideration. "THE PRESTIGE is absolutely one of my favorite movies this year. It's original and engaging and most of the twists aren't nearly as obvious as Jodie Foster's reasons for choosing pants over a skirt."